At Spares Marine we prioritise quality service, value for money and a genuine care for our customers. No one likes long-winded and boring Terms and Conditions, but we want to make you aware that we'll never share your private data, our site is secure and your consumer rights are protected. These Terms & Conditions govern your use of the Spares Marine service and website. By visiting the Spares Marine website you accept, and agree to, the content of these Terms & Conditions. We reserve the right to change the Terms & Conditions at any time and it is your responsibility to check regularly before ordering. This does not affect your statutory rights. When you place an order via our website (www.sparesmarine.co.uk) we will treat that action as an offer to buy. Once the order is placed you will receive confirmation in the form of an email and at this time we enter into a contract with you. Published product details, specifications and suitability information is the best available at the time. Spares Marine shall not be held responsible for the accuracy of any advice given regarding the suitability (or otherwise) of any part(s) required for repair work undertaken. If you have ordered an item that has an unsuitable product description we will remedy this by providing you a full refund upon the return of the item. Please see our Returns Policy below. Manufacturers’ names are used for reference only. Products listed are genuine spare parts, made by or sourced via the manufacturer. Any non-genuine parts listed as compatible with the manufacturer's finished model number will be clearly marked, so you will be fully aware when you come to make your purchase. We encourage you to ensure all spare parts are fitted by a competent person in accordance with manufacturer specifications. Spares Marine cannot be held liable for any damage caused by the fitting of a spare part. Please ensure that you have read your warranty conditions before attempting to install a part or otherwise repair your marine product. Spares Marine cannot be held responsible if the marine product is damaged or your warranty is voided. Some manufacturer guarantees may be on condition that you use a qualified technician. You will see that items not in stock are unable to be added to your basket. Instead, you will have a link to click on. This will open an email link to us, pre-headed with the part number, so that we can advise you the likely delivery time of the item you have selected. We have taken this measure as some of the models we supply spares for are very old and may even require parts made-to-order. Spares Marine has no liability to you for any delay in the delivery of products ordered. We will do our best to get all orders out as quickly as possible. You have the right to cancel delayed orders at any time and get a refund by contacting our Customer Service Department. Occasionally we find ourselves having to withdraw an item because it has become obsolete or has been discontinued. If you have placed an order for an item that has been made obsolete we will inform you as soon as possible and offer you an alternative if one is available. If not, we will refund you in full. Payment over the Internet can be made via our secure check out pages using Visa, Visa Electron, MasterCard, Switch or Solo cards and PayPal. Charges will appear on your statement as "Neptune Spares LTD" or “Spares Marine”. Due to the nature of the clearing system your credit card payment will be taken at the point of ordering. If a problem in supply should occur and you would like to cancel your order we will be happy to assist you in obtaining a refund via our Customer Services Department. If your delivery address is outside of the UK, you may be required to pay import duties and taxes when your Spares Marine order reaches your country. These and any additional charges for customs clearance are your responsibility. Most items will be delivered using Royal Mail but some expensive, bulky and/or fragile products will be shipped via Special Delivery or private courier. If you haven't received your items within 14 days of the date of despatch, they can be declared "lost in transit" and we will arrange a replacement order. For deliveries outside of the UK, we need to wait 3 weeks before a missing order can be declared "lost in transit". Orders may be cancelled at any time before they are despatched for a full refund, via Customer Services. If the item has already been despatched then please see below for our returns policy. You have the right to cancel your order and request a Returns Number within 14 days of the date of delivery. Please notify our Customer Service Department of your intention to return your item(s) within this time and we will promptly issue you with a Returns Number. You must quote this number on the correspondence accompanying the return. You must return your item(s) within 14 days of your Returns Number being issued. Due to the volume of orders and stock we handle, returns will only be accepted for credit or refund with a Returns Number. Provided that you return your item(s) in accordance with these Terms & Conditions we will refund what you've paid for the item(s) or replace or exchange the item(s) if applicable. Refunds are processed within 5 working days of receipt of the returned item(s). Refunds are made using the same form of payment that was used to make the initial purchase. We will never sell or pass on your name and address to any other organisation without your consent. Your details are confidential and you will never receive unsolicited mail as a result of ordering from Spares Marine. We expect you to maintain the confidentiality of your username and password for your Spares Marine online account and “My Boat” sections. 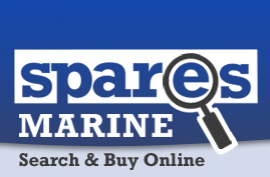 All content included in this site, text and graphics (including copyright), is owned and controlled by Spares Marine. In accessing the Spares Marine web pages, you agree that you may only download the content for your own individual and non-commercial use. You are not permitted to copy, broadcast, download, store, transmit, show or play in public, adapt or change in any way the content of these Spares Marine pages for any other purpose whatsoever, in any medium, without the prior written permission of Spares Marine. If you have any further questions regarding our Terms and Conditions, our Customer Services Department is available via email or on the telephone and will be happy to assist.